Max is not your normal duck, unlike most ducks who fly south for the winter, Max decides to stay. Max however is not always the best house guest, he hogs the remote, makes himself awfully comfortable in Brody's bed (the dog), and just about as everyone has had just about enough of Max he returns to his flock. Sometimes you never quite know how much you will miss someone until they are gone, Irene and her pets learn this the hard way after Max is gone. Don't worry Max returns, with a huge surprise... lol you'll just have to read it to see. Duck at the Door is a cute story with a lot of openings for a series. Connor loved the pictures of all the animals (his favorite is always the dogs) and the illustrations are fun to look at. There is a good lesson to be learned about tolerance and friendship as well. 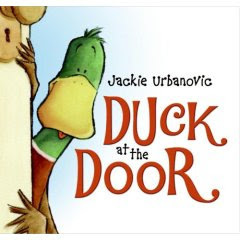 Check out Jackie's web page and her page dedicated to Duck at the Door, it's a lot of fun to see some of the real pets that inspired the characters in the book as well as to see Jackie at work! Duck at the Door is available at most major book retailers as well as Amazon!